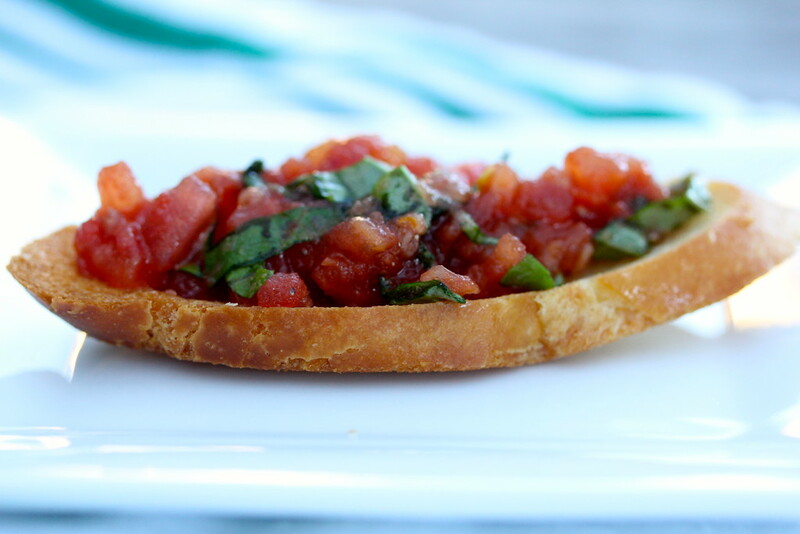 Tomato topped bruschetta is simple, healthy, and delicious. It makes a wonderful appetizer. So.... I found this suggestion on Fine Cooking which recognizes that seasoning the tomatoes with salt and draining them for five or ten minutes will remove some of the excess water. So if these instructions say five to ten minutes, what's wrong with 30 to 45 minutes? Look at all of this water! I combined the recipe I had been using with the salting method I found on the Fine Cooking recipe. The results were kind of amazing. Happy happy joy joy. The combination of flavors.... really good. Really, really good. 7 to 8 medium sized tomatoes. I typically use Romas because they are more consistently fresh here, but if you have access to fresh heirloom or other tomatoes, use them. In a three or four quart sauce pan, boil water. Once the water has boiled, remove from the heat, place the tomatoes into the water, and set a timer for one minute. At one minute, drain the tomatoes into a colander and allow to cool slightly. Slit the tomatoes with a sharp knife and slip off the skins. Cut the tomatoes in half and remove the seeds and white pithy stuff. 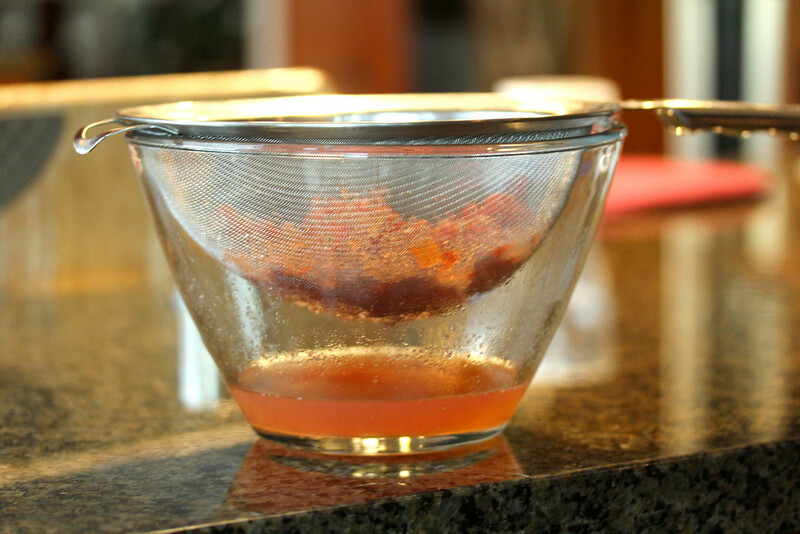 Chop the tomatoes into small pieces and place the pieces into a strainer over a bowl as pictured. Sprinkle the tomato pieces with the salt and stir. Let the tomatoes sit over the bowl and drain for 30 to 60 minutes, stirring occasionally. 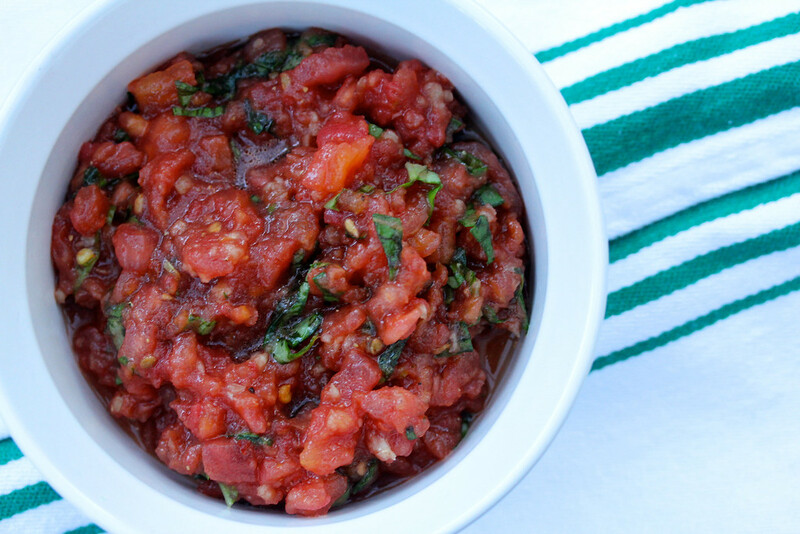 Place the tomatoes in a small bowl and add the rest of the ingredients. Brush the baguette slices with olive oil and bake on a baking sheet in the oven for 8 to 10 minutes, until lightly golden and crispy. Cut the large garlic clove in half and rub both sides of each slice of bread with the garlic. 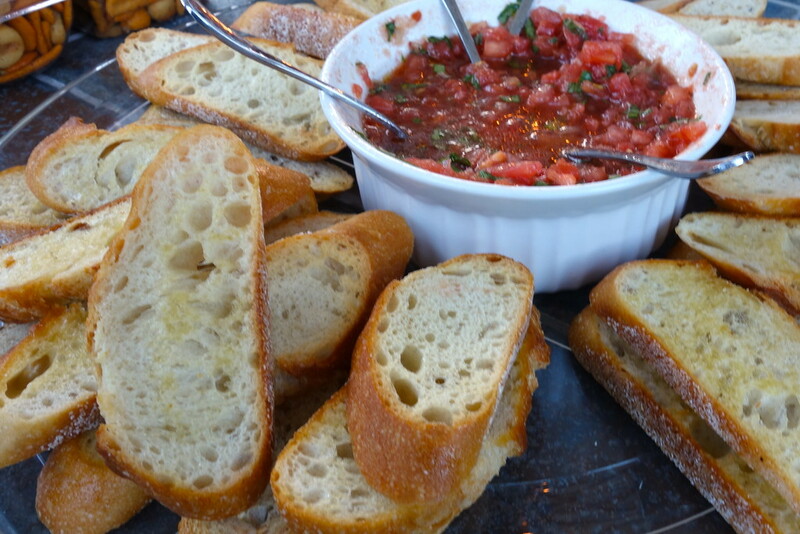 Serve the bruschetta with the tomato topping on the side. This would work really well with fresh salsa too! Genius ... how come I didn't think of rubbing the bread with garlic or draining the mixture ..pure genius.. plus it looks amazing.. thanks for sharing. Awww. Thank you =) You can stick the garlic with a fork to give it a "handle." Goes really quickly that way. Salt the tomatoes?! it's amazing how that one step can change an entire batch! You've just salvaged my salsa-making reputation, thanx. Thank you Dee! 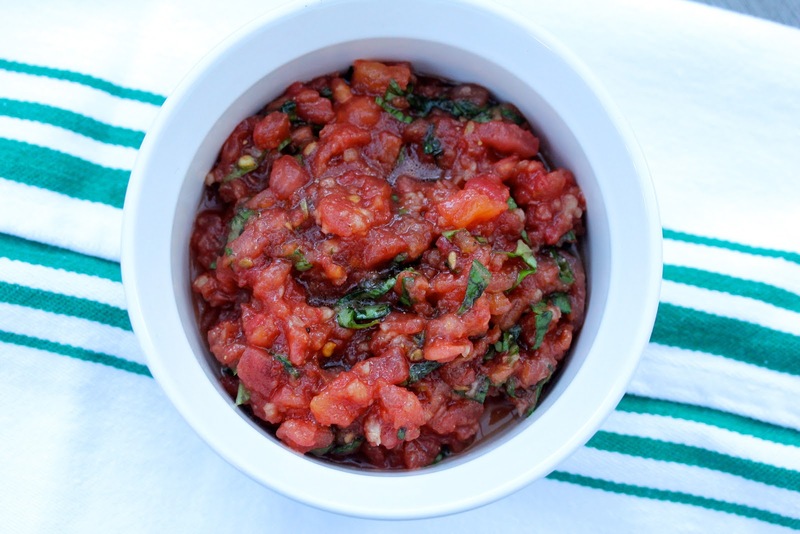 I am looking forward to trying this with salsa and pico de gallo as well! On my list for summer.